Lower Valleyfield View occupies the site of the station and goods yard and no evidence of the station remains. The bridge that once took the siding under Peebles Road to Bank Mill is the only evidence that a railway ever existed. The bridge is now used for road traffic. Notes: All the stations on the Penicuik branch had modest platform facilities, and although the station building at Penicuik was larger than at the other stations it was still quite basic compared with many termini. The 13-bay single-storey building was very plain and of brick construction with a pitched slate roof. It was set at the back of a small forecourt off Valleyfield Road with the booking office entrance in the centre of the building. Coming out of the booking office onto the platform, station office and staff rooms were to the left with ladies’ and general waiting rooms and gents’ toilet to the right. There was no canopy or passenger protection in front of the building. The platform was on the down side of the line together with a run-round loop. The line continued to a turntable and engine shed beyond the platform. 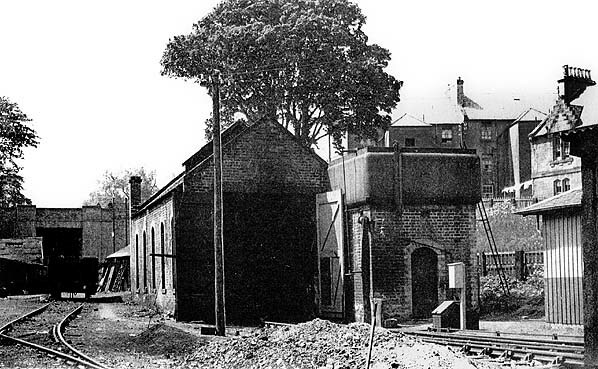 The single-road brick shed with its adjacent cast iron water tank on a brick tower opened with the line and remained in use until closure of the branch to passengers in 1951. However the turntable had been taken out of use and removed before 1932. 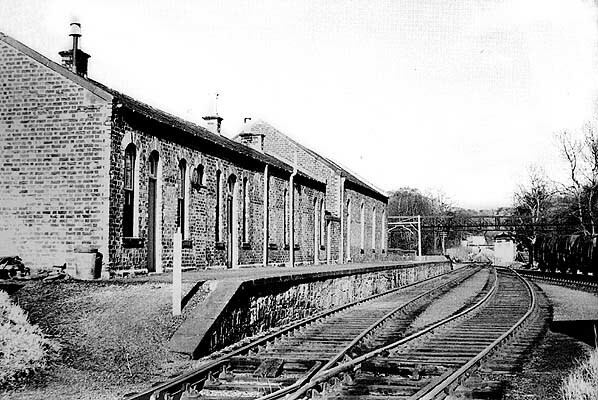 There were three sidings opposite the platform; one of these ran under Peebles Road to the west of the station to serve the Bank paper mill, which specialised in the production of Bank of Scotland notes. In later years constricted access through the arch led the NBR to issue an instruction that covered vans could not be dealt with at the mill. By 1907 the goods yard had been enlarged with one additional siding, and by 1932 the short siding into Valleyfield Mill had been extended, passing a large covered dock on the west side of the mill then around the north side of the mill to join up with the line from Low Mill - see maps below. 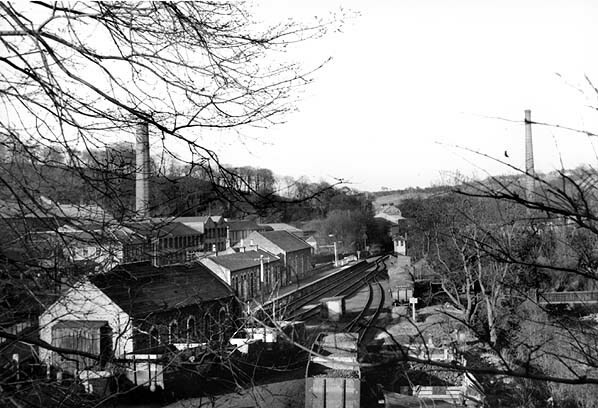 By 1961 the siding into Bank Mill had been lifted. 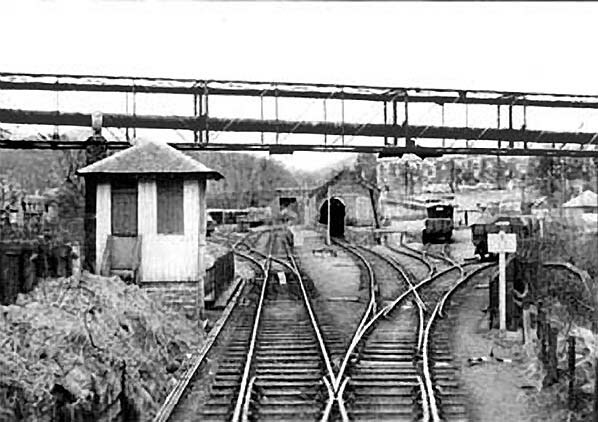 Access to the goods yard was controlled by a signal box on the up side of the line opposite the entrance to the yard. Penicuik closed to passengers on 10 September 1951 but remained open for freight traffic, mainly generated by the paper mills. The last passenger train to visit the station was the Branch Line Society/Stephenson Locomotive Society ‘J36 Railtour’ on 29 August 1964. The goods yard closed from 27 March 1967, although the last goods working was actually in April. The track was quickly lifted but all the buildings remained until c.1980. Valleyfield Mill closed on 1 August 1975 and was demolished in 1980. Penicuik is a burgh in Midlothian on the west bank of the River North Esk. It is an ancient settlement which became the market centre for farms and villages along the south-eastern slopes of the Pentland Hills. The town lay on the edge of the Lothian coalfield and was well known for its paper mills that were established along the North Esk from the early 18th century; the last of these closed in 2004. During the 19th century, owing to its picturesque surroundings, the town developed as a residential centre for professional people working in Edinburgh. Peebles but it was deleted from the Bill. A branch from the Caledonian's Glasgow route to Peebles was also dropped, but it marked the start of fierce competition between the Caledonian and the NBR to bring the first railway to the area. In the meantime an independent group was formed to promote a double-track line from Edinburgh to Peebles via Penicuik. Sufficient capital was raised and a Bill was put before Parliament in 1846, but it fell by the wayside as ‘Railway Mania’ gripped the country. There were no further schemes until 1851 when a group of influential Peebles residents and businessmen once again put forward a proposition to put Peebles on the railway map. The suggested route would run from a junction with the Edinburgh and Hawick line at Eskbank via Bonnyrigg and Hawthornden to the south of Penicuik to a summit at Leadburn, from where it would descend the Eddleston valley into Peebles. A locally based company was formed, and a Bill was put before Parliament. The Peebles Railway Act received Royal Assent on 8 July 1853. The first sod was cut at Peebles at a well attended public ceremony on 9 August 1853, with work also beginning at Eskbank. The board decided to work the line themselves rather than hand it over to the NBR, as this would bring additional revenue for the shareholders. Staff were recruited to run the line, and suitable locomotives and rolling stock were ordered. In March 1855 the contractors, Bray and Dyson, announced that the line could be opened in May, and in April the company’s loco Soho completed the inaugural trip into Peebles from Eskbank. The first passenger train pulled into Peebles on 29 May 1855 carrying invited guests. Penicuik station was one mile south-east of the town centre. It was a steep climb up to the town and the site did not serve any of the town's industries. Understandably the people of Penicuik were unhappy with this situation, and they approached the Peebles Railway board with a request for a short branch to a station closer to the town centre; this was declined. As a result, the Penicuik Railway Company was formed with the intention of building their own line into the town. A proposed route was surveyed from Hawthornden, on the Peebles Railway, to the Valleyfield Mills on the south side of Penicuik, half a mile closer to the town than the existing Peebles Railway station. On 28 June 1870 the nominally independent Penicuik Railway obtained an Act to build their 4 ½-mile branch to Penicuik from a junction with the Peebles Railway at Hawthornden. In the same year the Shotts Iron Company opened Mauricewood Pit near Penicuik to mine ironstone, which gave additional impetus to build the railway. Edinburgh-based engineer Thomas Bouch, who had previously built the Peebles Railway, was employed to build the line. The Penicuik Railway ran through the North Esk valley for its entire length, crossing the river no fewer than seven times in just 2½ miles. It was also heavily engineered virtually throughout its length, with a ten-arch viaduct and two tunnels. Remarkably the branch ended just below 550ft above sea level, the same altitude at which it began. The line opened to goods traffic on 9 May 1872 and to passengers on 2 September 1872, with intermediate stations at Rosslyn (later Rosslyn Castle) and Auchendinny. When the Penicuik branch opened, the Peebles Railway station was renamed Pomathorn after a nearby farm, although the station signs always read ‘Pomathorn for Penicuik’. The Penicuik Railway never had its own locomotives or rolling stock but was leased to the North British Railway company who worked the line from the start. Like many rural branches, the Penicuik Railway was built mainly for goods traffic. There were three paper mills along the route at Dalmore (Auchendinny), Eskmills and Valleyfield, beyond the end of the line. The first train to use the line was a delivery of esparto grass (used for fibre production in paper making) to Dalmore Mill. The Valleyfield Mills had originally been worked by French prisoners during the Napoleonic Wars. 300 prisoners died there and in tribute to them in 1855 the town of Penicuik unveiled a monument inscribed, ‘In recognition that all men are brothers’. Apart from the paper mills, the line also served the gunpowder mills in Roslin Glen. The owners of the mills pressed the Penicuik Railway to cover the line as it passed the mills and eventually the Privy Council were asked to investigate the matter. After an inspection between 12 and 19 January 1872 the Penicuik Railway was ordered by the Board of Trade to cover the line. Therefore a 300 yd metal tunnel was constructed south of Rosslyn station. Following local pressure a third intermediate station was opened at Eskbridge on 1 July 1874. In addition to its value as an outlet for goods traffic, for some decades the Penicuik branch provided a useful service as an outlying Edinburgh commuter line. Another line in Midlothian, the Edinburgh, Loanhead & Roslin Railway (ELR), had opened from Millerhill Junction on the NBR’s Edinburgh-Hawick-Carlisle ‘Waverley route’ to Loanhead in November 1873. In 1875 the Shotts Iron Company sunk a new shaft at Mauricewood and the ELR applied for permission to extend their line to Glencorse, near the pit. Representatives of the Penicuik Railway strongly opposed this in the House of Commons, as they saw such a move as encroachment into their territory. An agreement was eventually reached whereby all traffic south of Auchendinny on the Penicuik line, and south of Roslin on the Glencorse line, would be common to both companies and that profits should be split evenly between the two. The ELR was thereby extended to Glencross (later Glencorse) on 2 July 1877. Before this happened, the Peebles Railway and the Penicuik Railway were both fully absorbed into the North British Railway on 1 August 1876. 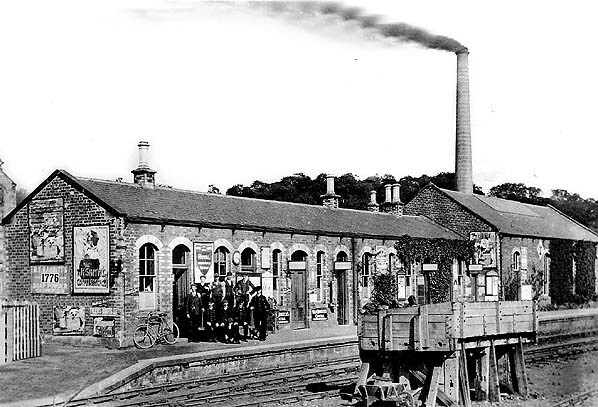 The NBR also leased the ELR and absorbed the company on 31 July 1878, after which the Glencorse line was further extended to Penicuik Gas Works. In 1887 there were five weekday trains with no Sunday service on the Penicuik branch. In 1889 a fire broke out at Mauricewood Pit. It is believed that miners hit a magma chamber underground and this theory is supported by a minor volcanic eruption which took place at Mauricewood in 1975. The resulting blaze claimed 70 lives and caused the pit to be closed. This was a major loss to the finances of both the Penicuik and Glencorse branches. During the First World War the railways of Britain came under control of the government’s Railways Operating Department, who had the power to order wartime economy measures. Due to a shortage of manpower, one of these measures was the closure of many smaller stations; Eskbridge was one of these, losing its passenger service from 1 January 1917 and reopening on 2 June 1919. In 1922 the service had improved with seven trains in each direction between Penicuik and Edinburgh Waverley, but three of them did not call at Eskbridge; no trains calling there after mid-afternoon. Whilst the 130 UK railway companies coped well during the war, there were calls for more consolidation, and even for nationalisation of the railway system. The government reached a compromise, and from 1 January 1923 all the companies were grouped into just four large companies, ‘The Big Four’. Under the ‘grouping’ the North British Railway became part of the London & North Eastern Railway (LNER). By this time motor transport was making heavy inroads into railway traffic, and closure of the least remunerative stations was a response to this competition. The LNER closed Eskbridge station completely on 22 September 1930. The railways came under minimal government control again during the Second World War and there were renewed calls for nationalisation. This was one of the pledges of the Labour Party, who were swept to power in 1945. They fulfilled this promise from 1 January 1948, when all the railways in the UK came under full government control as British Railways. Railways north of the border came under the auspices of British Railways, Scottish Region (ScR). In 1950 the Penicuik service was the same as before the 1923 ‘grouping’ with seven daily trains in each direction, but some did not stop at Auchendinny, and an additional up train missed out Rosslyn Castle. With continuing popularity of cheaper bus transport and private car ownership, stations and entire lines began to disappear. 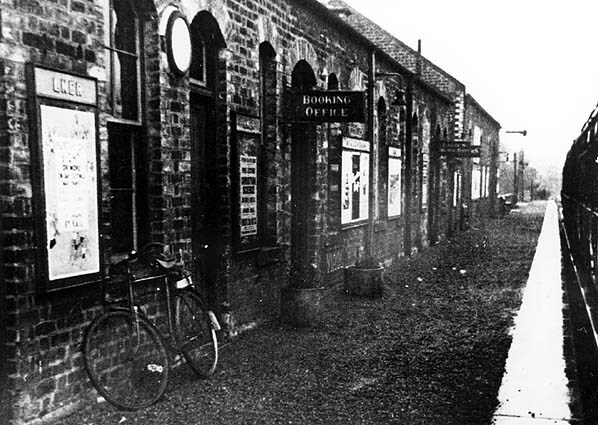 Auchendinny station closed to passengers on 5 March 1951 to save costs owing to a shortage of coal. The branch, with its two remaining stations at Rosslyn Castle and Penicuik, closed to passenger traffic on 9 September 1951. 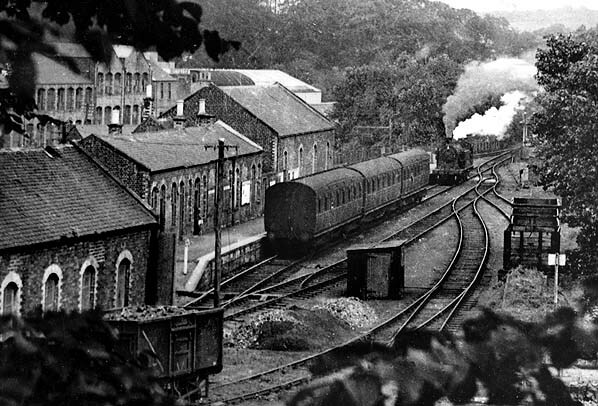 Goods traffic continued, although Rosslyn Castle closed to this traffic on 3 August 1959, and eventually there was only one goods train daily to Penicuik. threat, and this was exacerbated by two landslides which took place in 1966. The BR Chief Civil Engineer surveyed the line and concluded that only extensive repairs would prevent any further damage. The line closed to all traffic on 27 March 1967, and the tracks were quickly lifted. Having been built on ash ballast, the disused railway made an excellent path which people were quick to adopt for walking, cycling and horse-riding. In 1980 the Edinburgh cyclists group, ‘Spokes’, published Edinburgh for Cyclists, which suggested a cycling tour utilising part of the route from Hawthornden to Dalmore Mill. By 1983 ownership of the line was taken over by Lothian Regional Council, who turned it into a proper country walk and cycleway. Lothian Region was abolished in 1995 and ownership passed to Midlothian Council. The former Whitehill Colliery at Rosewell became an opencast coal mine in the 1980s, and the routes of parts of the Peebles and Penicuik railways were destroyed by these operations. However once opencast mining was finished the land was landscaped, and the path was reinstated roughly where the original railway had been. 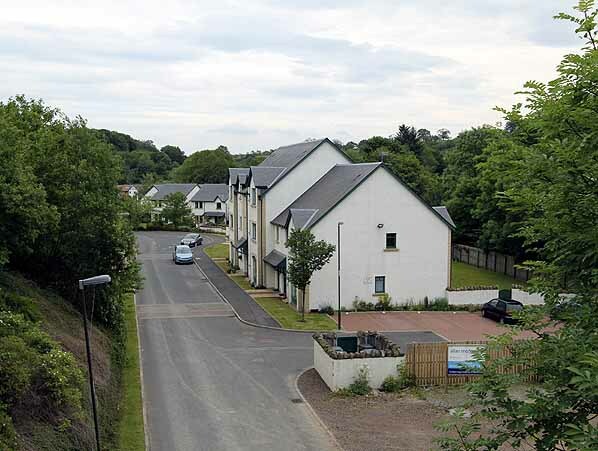 Sadly, Hawthornden Junction is now lost forever with the building of the Rosewell Bypass. Today the Midlothian Council Ranger Service maintains the path and has since extended it, with the addition of two sections. It now runs from Sherrifhall, near Edinburgh, to Valleyfield in Penicuik. The 9½-mile path takes in part of the former Waverley route to Hardengreen (part of National Cycle Route 1), the Peebles Railway from Hardengreen to Rosewell and the former Penicuik Railway from Rosewell to Penicuik (Regional Route 73). Ticket from Michael Stewart, route map drawn by Alan Young. Penicuik station c. 1905. The chimney of Valleyfield paper mill is seen behind the goods shed. 1907 1:2,500 OS map. An additional siding has been added to the north of the goods shed. 1932 1:2,500 OS map. The turntable has been removed and new sidings have been added running right round the Valleyfield mills. 1961 1:2,500 OS map. Penicuik is now shown as a goods station. There are some changes to the layout of the sidings including the addition of a small turntable at Valleyfield Mills. Penicuik station looking east in 1932. A train for Edinburgh Waverley stands in the platform. 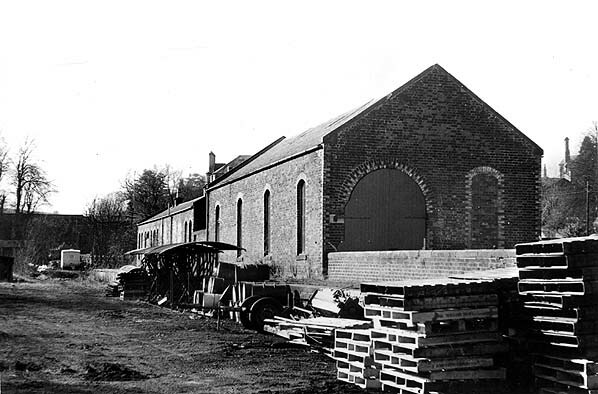 Penicuik engine shed c. 1936. The siding on the left goes under the bridge to serve Bank paper mill. Edinburgh Waverley in July 1950. View of Penicuik station, engine shed (bottom left) and Valleyfield paper mills in April 1955. The chimney on the right is part of the Low paper mill. Looking west towards Penicuik station in 1960. The goods shed is seen to the right of the station platform. To its right there is a wide loading dock served by three sidings (one end-on); a 3-ton crane stands on the dock. Beyond the station the bridge taking the siding to Bank Mill can bee seen. Branch Line Society/SLS J36 railtour at Penicuik on 29 August 1964. 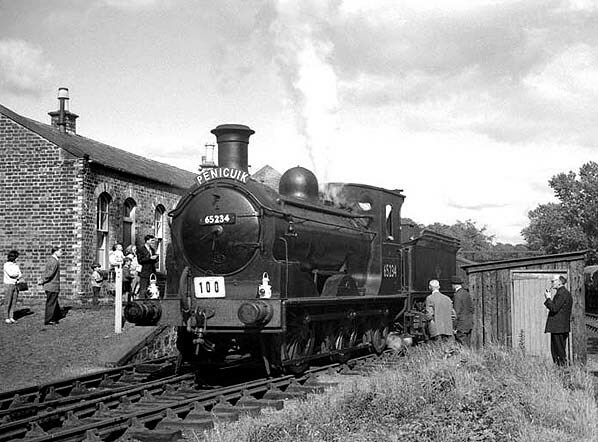 This was the last passenger train to use the Penicuik branch. 65234 is an ex NBR/LNER J36. Built between 1888 and 1900 to a Holmes design, these locos were rebuilt by Reid and Chalmers. 65234 was withdrawn from St Margarets shed on 22.4.67 but lasted at the shed until July of the same year as a stationary boiler before being cut up. One example (65243, Maude) is preserved by the SRPS. Penicuik station looking south in February 1967. Clayton D8561 with the last freight service to Penicuik in early April 1967. 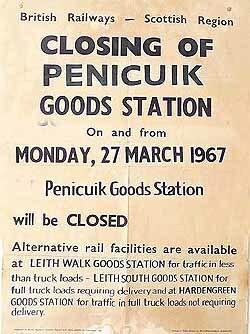 This is after the official closure of Penicuik from 27 March 1967. 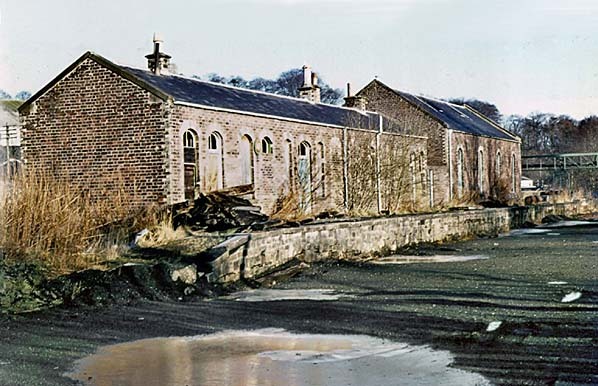 Penicuik goods shed and station looking south in February 1973. 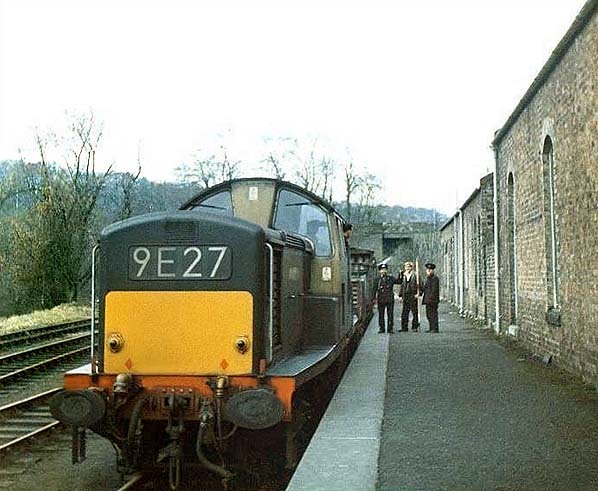 Penicuik station in January 1976.